An unordered list starts with the “ul” tag. Each list item starts with the “li” tag.The list items are marked with bullets i.e small black circles by default. Disc : Sets the list item marker to a bullet i.e default. Circle : Sets the list item marker to a circle. Square : Sets the list item marker to a square. An ordered list starts with the “ol” tag. Each list item starts with the “li” tag. The list items are marked with numbers by default. The type attribute of the <ol> tag, defines the type of the list item marker. Type=”1″ : The list items will be numbered with numbers i.e default. Type=”A” : The list items will be numbered with uppercase letters. Type=”a” : The list items will be numbered with lowercase letters. Type=”I” : The list items will be numbered with uppercase roman numbers. Type=”i” : The list items will be numbered with lowercase roman numbers. The <dl> tag defines the description list, the <dt> tag defines the term name, and the <dd> tag describes each term. 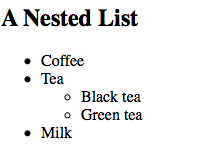 A nested list is a list which has a list inside a list.